Started by the slightly bohemian Mike Rhodes over 30 years ago and acquired some 11 years ago by Glen Weston and his wife Andrea, Cley Smokehouse is now a thriving little business dedicated to providing top quality honest food at sensible prices. Over the years we have become a local landmark and a ‘must visit’ for locals and visitors alike in their quest for taste and quality. We’re not a factory or a big retailer. All our smoked fish and meats are hand crafted in-house from top quality ingredients, sourced locally wherever possible and from sustainable resources. Every smokehouse has a unique flavour from the wood, the way things are done, the raw materials and even the smoker. Here at Cley everything is smoked over Oak to our own recipes and our own processes to produce food with real flavour and above all honesty. Although we produce smoked duck and chicken, our range is dominated by seafood. 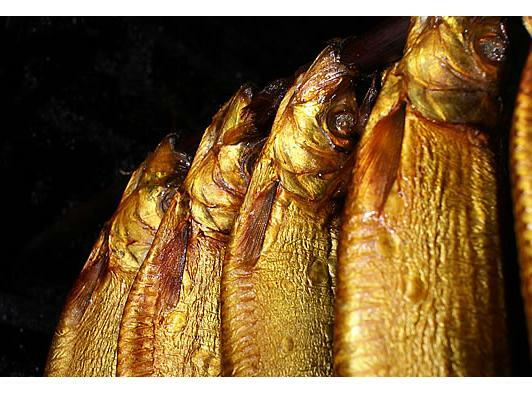 Beautiful plump kippers, undyed smoked haddock, our delicately smoked prawns and crevettes, smoked salmon and of course the classic Norfolk bloater. The latest addition to our range is a unique selection of cured salmons from Whiskey & Ginger to Citrus & Lavender, if you enjoy Smoked Salmon and Gravlax well worth a try. There’s the old saying “You can take the fisherman out of the sea but you can’t take the sea out of the fisherman”. Well perhaps we sort of adapted the saying to fit our philosophy. The Westons are an old Norfolk fishing family and as Glen is no exception we still keep our hand in with our own beach boat landing lobster and ‘Cromer’ crabs in season to sell through the shop and the website. You don’t get much fresher or better traceability than that. Our domain name is over 10 years old and we’ve been trading on-line now for the majority of that time! You may have noticed we have recently re-vamped the website and it’s now our ambition to take the Cley Smokehouse food philosophy to the four corners of… well the UK for now anyway. We will be slowly expanding our own range as well as taking on-board selected products from local suppliers like ourselves.